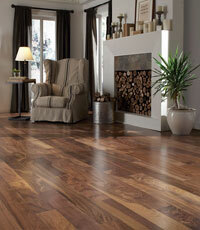 We can help you find your ideal Mullican hardwood floors. How do you plan to install your flooring? Choosing the right color for your hardwood flooring is a big decision. We recommend considering a few key color factors. First, take the size of your room into consideration. 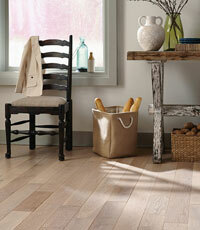 Small rooms, or those with low ceilings, flourish with light-colored flooring, creating the feeling of more space. 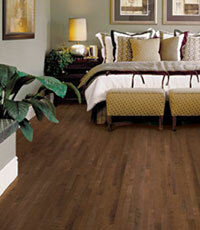 Second, the color of your hardwood flooring should complement the color of your furniture or walls. The overall design will be most successful if the colors contrast and complement each other well. Lastly, consider how the color will appear different under various lighting such as natural light (both day and night), fluorescent, or warm lighting. If needed, take a sample home to help you make your decision. Afraid you'll get tired of your color choice? No worries, both solid and engineered hardwood options can be sanded down and re-stained again. Where will you install your flooring? Did you know that the location of your floors can make a difference in which material you should choose? Below grade spaces, like a basement, can often have higher moisture content or humidity. So if you plan to install your floors below grade, choose an engineered hardwood. 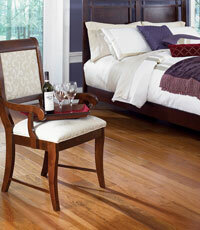 Mullican offers a wide variety of beautiful engineered hardwood floors, handcrafted to last a lifetime. Spaces at grade or above grade are great for solid hardwood or engineered hardwood, bringing the warmth and beauty of genuine wood to your home. If you’re installing solid hardwood, just remember to acclimate the product in your space for at least 5 days before installation. There are a few standard ways to install your Mullican hardwood floors. The best way may depend on your subfloor. Your subfloor is the foundation of your flooring and can vary depending on its location in your home or dwelling place. Your profile has been created! Now you have what you need to create your perfect floor. Review a summary of your preferences and our recommended products. Reference this with your local retailer or share it with friends.